Early each year, gardeners watch in earnest to see the first Spring flowers bloom at Chanticleer Gardens in rural Pennsylvania. 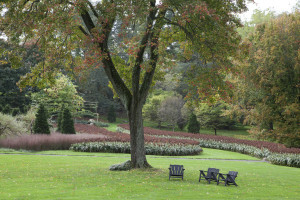 Chanticleer, one of America’s premiere gardens, is open for tours from early Spring until the chill of Fall begins. 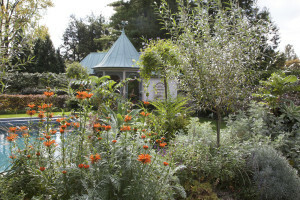 Chanticleer has been labeled as one of the most theatrical gardens in the world. The garden is built on the former Rosengarten estate located in Wayne, Pennsylvania, about 30 minutes outside of Philadelphia. 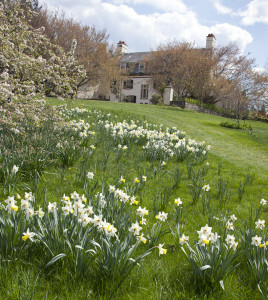 This year, Opening Day at Chanticleer Gardens was Wednesday April 2, 2014. Gardeners of all ages are waiting in anticipation for the chance to explore the beautiful gardens. Thirteen different garden areas are featured within the almost 50 acre property. Visitors can start out at the Parking Lot Garden which reminds one of how beautiful a normally unattractive paved area can become with just a little love and care. 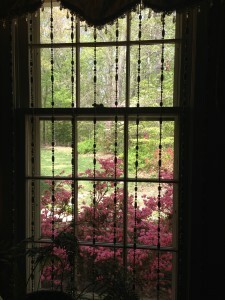 The stately main house itself anchors the flora setting and is open for tours by reservation. Be sure to visit the Tennis Court Garden and the Cutting Garden which are popular favorites amongst gardeners. Be sure to take notes along your journey. Chanticleer is a study in reuse and recycling and prides itself on its ability to increase its positive effect on the environment. Solar power and rainwater collection are but two of them. Most of the intriguing garden has been developed since the owner’s death in 1990. Any visiting gardener is going to marvel over the well-thought-out color combinations of plants and the whimsical garden ornaments. What a treat! Quiet time is key at the garden. The staff encourages visitors to sit and ponder, read a book, enjoy a picnic at one of the designated picnic tables, and explore the 13 different garden spaces. On Fridays evenings from May through Labor Day, visitors are invited to picnic throughout the garden. Stroll throughout the property, stop and relax from time-to-time, and get some truly fascinating ideas for your own garden. The 2014 season began on April 2nd and ends on November 2nd. Chanticleer is open 10:00 a.m. to 5:00 p.m. Wednesday through Sunday. The garden is also open on Friday evenings until 8:00 p.m. from May through Labor Day. Daily passes are available to the general public with discounts offered to members of certain clubs and even free admission is offered to those in the gardening profession. Season passes are available for those who live locally. See the website for details. 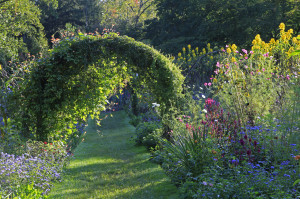 Adrian Higgins, a garden writer for the Washington Post newspapers, has penned this lovely book, Chanticleer: A Pleasure Garden . Get a copy of the book here and marvel at Rob Cardillo’s colorful and intriguing photographs. 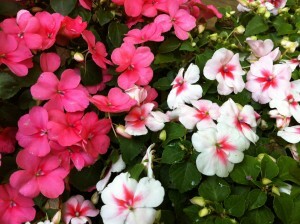 For more information, visit the official website: http://www.chanticleergarden.org. 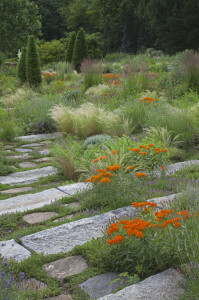 And you can Follow Chanticleer Garden on Facebook. Travel is easy by car. Major airline transportation is available to Philadelphia, PA. Amtrak train service is available to Philadelphia from major East Coast cities. Then, take a rental car for the 30 minute drive to the gardens. Stay in a nearby hotel, or bed-and-breakfast, and enjoy your time at one of the most gorgeous gardens in the United States. Local restaurants serve a bounty of cuisines to satiate your palate.